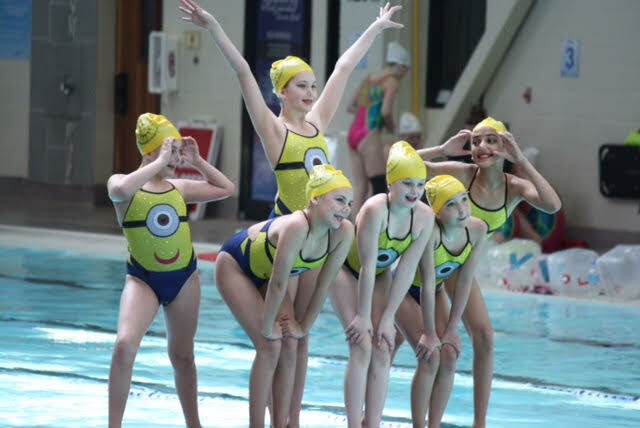 The Kamloops Sunrays Synchro Swim Club offers synchronized swimming programs to swimmers from age 6 to 96, beginner to advanced. Scroll down to see detailed descriptions of our Recreational and Competitive programs. FREE See-It-Try-It sessions will start again this September! FREE 1 hour classes at the Canada Games Pool, and find out what synchronized swimming is all about! See-It Try-it! Contact us to reserve your spot ! Come Join the Kamloops Sunrays for our Annual Summer Camp. Our new head coach, Tina Naveri, will be introducing the new FINA Figures, safe highlight training, LTAD skills and much more. This 5 day camp will also include martial arts, stroke correction by a certified speed swimming coach and skills need to succeed in the amazing sport of Synchronized Swimming. Athletes and coaches of all levels are welcome to attend. The cost of the camp will be dependent on interest and the number of athletes in attendance. If you are interested, Email us at headcoach@kamloopssynchro.com go get your name on the list! Registration info for the camp will be sent out mid-end of July with the price of the camp. Our Intro to Synchro program introduces and refines basic synchronized swimming skills and team based routines. This program is designed for kids between the ages of 6 and 12 who are comfortable swimming in deep water. We introduce and continue to teach basic swimming skills throughout the program. Programs run at the TCC Canada Games Pool. Schedule subject to change. A competitive program based on basic to intermediate synchro skills that incorporates individual skills, fitness, and creative routines. Age of athlete must be inside the age bracket as of December 31st of that season year. Athletes from different age groups may be combined to form a team. This program is designed for novice to intermediate level athletes who are comfortable swimming in deep water and have advanced from our recreational programs or have other athletic experience. Athletes will practice 3 - 4 times a week (plus extra routines) at the TCC and have the opportunity to compete in 3+ Regional and Provincial competitions in B.C. A comprehensive physical and mental training program that meets the unique needs of athletes competing at the National level. This program offers a diverse and flexible learning environment that challenges our athletes to build on their strengths and develop new ones while striking a swim-life balance that's right for each individual. Goals of this team are to qualify and compete at Canadian National Qualifying Challenge, and the Canadian Championships. Age of athlete must be inside the age bracket as of December 31st of that season ending calendar year. Athletes will practice 5 times a week at the Canada Games Pool pool in Kamloops as well as participate in strength and conditioning and gymnastics classes focused on improving physical strength and flexibility. Designed just for adults 18 or better, participants with varying degrees of swimming competency can come together and enjoy the fun, friendship and fitness this program has to offer. In addition to endurance and stroke improvement, swimmers will learn the fundamental sculls and basic figures that are later organized into routine components and choreographed to music. For more proficient swimmers and retired athletes looking for the opportunity to stay active in the sport, our competitive program offers regular synchro training and structured workouts. Team decides attendance at Regional, Provincial, National and International competitions. "Extra" routines include Duet (A duo of 2, sometimes with an alternate), Solo, Combo (Combination Routine of Team, Duet, Solo, Trio all in 1). All Extra routines are allotted 1 hours OUTSIDE of regular team practice. This includes a ½ hour of dryland/landdrill. Extra routine placement will be determined by the head coach, and is in addition to the fee schedule for their competitive team placement. Athletes who participate on an existing competitive team will be considered for extra routines. Otherwise, if a team does not exist for the athlete(s) in question, an extra routine will be placed for them pending on coach and pool time availability. Special circumstances will be considered at the discretion of the head coach based on coach and pool time availability. However, the creation of a team will be priority over extra routines. Extra figures must be organized with the coach outside of regular team practice.